A portable fish finder can go places where regular finders can’t. Portable fish finders are great for when you can’t permanently mount a unit on a boat. They are a superb solution for temporary mounting on small boats, taking on trips, and fishing from shore. After reading our comprehensive guide of the best portable fish finders, you will be able to make a smart decision on which style and model suit your fishing. Whether you fish from shore, piers, kayaks, canoes, or float tubes, there is a portable unit that can help your fishing trips be more successful. Let’s dive right into it! 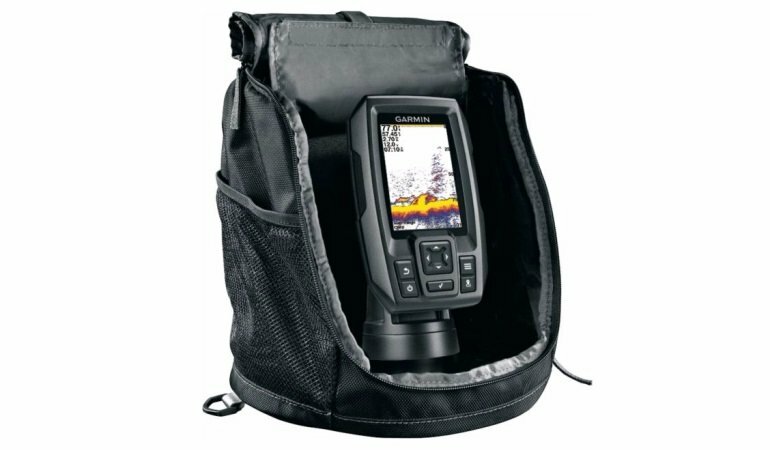 Portable Units: This is the traditional style of a portable fish finder. 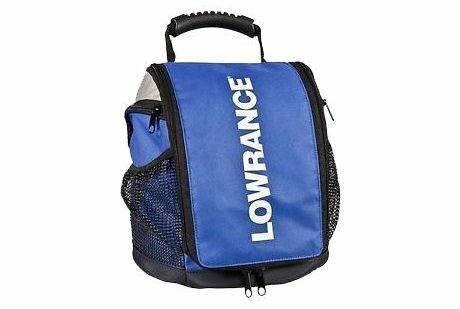 They typically consist of a nylon carry case that holds all the components of the portable kit: A small fish finder unit (3 to 7 inch screen), a plastic mounting base, portable transducer, and a small rechargeable 12V battery. They can be used for open water fishing or ice fishing, but work best when used with small boats. Castable: The new generation of portable fish finders utilize the power you already have in your pocket: the smartphone. 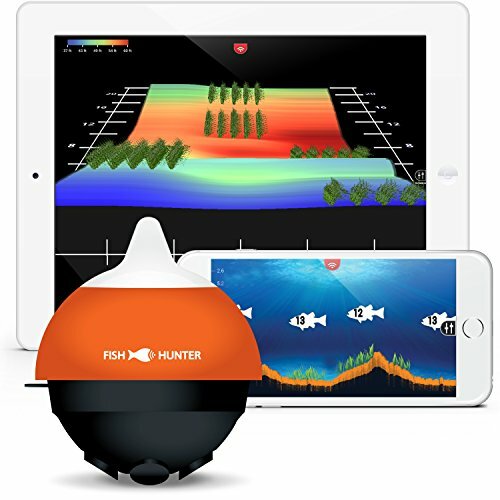 Instead of a self-contained fish finder unit, the castable fish finder consists of a small floating transducer that communicates with an app on your smartphone via Wi-Fi or Bluetooth. This is the best option for bank fishing, but can also be adapted to boat use. Mountable: This type of portable depth finder is one that you can temporarily mount to the side or transom of a small boat. They are also the only fish finder we are aware of that can work with a float tube (with the float tube accessory). Each of the major manufacturers has similar solutions for their Portable Units. You can get these portable kits with everything included, or you can buy a conversion kit and turn your existing fish finder into a portable one whenever you need it. 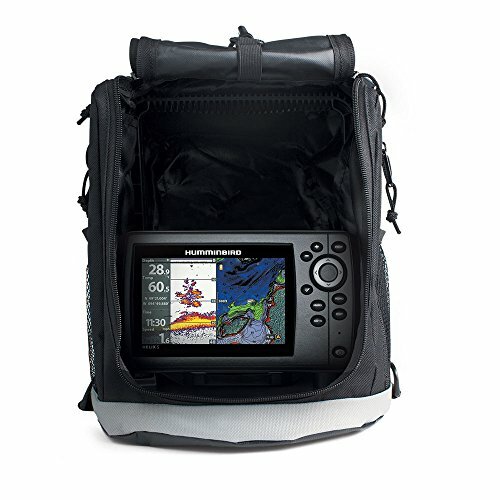 This is a popular portable fish finder unit from Garmin. It features the smallest model in the new STRIKER series, the STRIKER 4. That unit is a CHIRP Sonar only depth finder, with no imaging, and internal GPS but no map capability. There is a flasher mode and foam transducer float that can turn the unit into a passable ice fishing machine. If you want a better fish finder as part of your portable setup, it’s best to buy the unit you want and then buy the Portable Fishing Kit as an accessory. The Kit is compatible with STRIKER 4, 5, and 7 models, as well as 4” and 5” echoMAP CHIRP units. This way you can mount the fish finder and transducer to your boat most of the time, and when you want to take it somewhere else you have the portable kit with transducer ready to go. 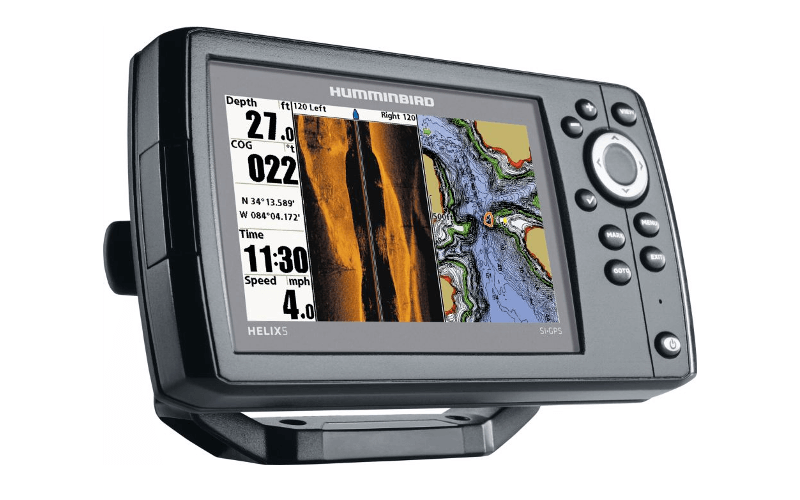 The newest HELIX 5 G2 is packaged into the portable kit from Humminbird. 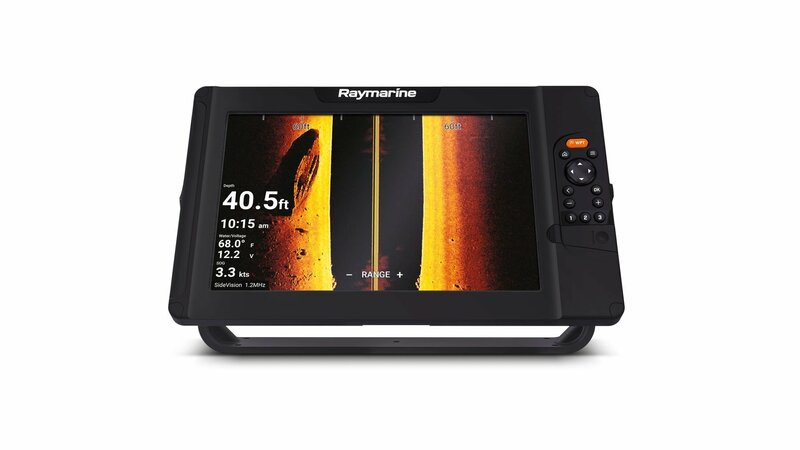 This is a CHIRP Sonar fish finder, with a wonderful bright 800×480 pixel display. It’s comparable to the STRIKER 5, but it is able to display lake maps (sold separately) on the GPS screen, which is a big advantage. Not only maps, but the HELIX 5 G2 also has AutoChart Live built in, so you can make a depth map on the fly. If you already own a HELIX 5 or HELIX 7 fish finder, you can convert your unit into a portable one by purchasing the accessory PTC U2 portable conversion kit. It comes with a soft side carry case, plastic mounts for the unit, a 9AH battery, and a charger. 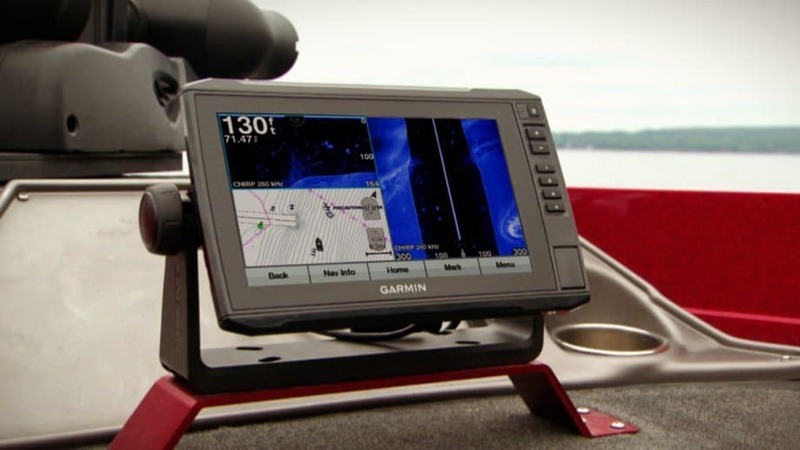 This is an awesome way to extend the use of a fish finder you already own. The Lowrance Hook3 All-Season pack offers a portable fish finder kit, just like the Garmin STRIKER and Humminbird HELIX. The kit comes with a Hook3 fish finder, an all-season bag, tackle trays, a 7AH battery, skimmer transducer, and a suction cup. This pack is useful in all seasons, as the name suggests, you can attach the suction cup transducer to any small boat, and you can utilize ice mode when it’s hard water season. The PiranhaMAX 4 PT is just like the bigger HELIX 5 PT, just with the smaller, simpler PiranhaMAX 4 unit. This is a sonar only unit, no GPS, no maps, just 200/455kHz 2D sonar. It’s a pretty decent cheap portable option if you don’t care about maps or GPS. Castable fish finders have become quite popular with bank fishermen, especially since the popularization of smartphones and apps. What you might not know is Humminbird had a castable fish finder called SmartCast, years before smartphones came around. SmartCast used RF signals to communicate to a small grayscale display that could be held on your rod, or as a wristwatch. Today, several companies have taken that idea and improved on it, by utilizing the powerful computer we all carry around in our pockets (the mobile phone!). The most popular options are Deeper, iBobber, and FishHunter. They look similar at a glance, but it is useful to compare them side by side when trying to figure out which one to buy. When comparing the three most popular castable sonars, you’ll come to the conclusion that they are very similar, and the Deeper Pro+ and FishHunter 3D are more advanced than the iBobber. They have more features and more advanced apps, but they also cost quite a bit more. Here is a side by side comparison. 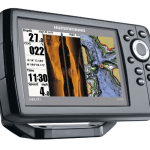 For the price of a Deeper Pro+ or FishHunter 3D, you could buy a regular small fish finder with maps. You also don’t have the issue of smartphone battery life and syncing with the transducer pod. For those reasons, these types of sonars don’t seem to make much sense for use on a boat, or even kayak fishing. That’s not saying they aren’t good or can’t be used for that, but that the best castable fish finders are probably best utilized for bank fishing. You might be surprised to know that Deeper was developed by Lithuanian company, but they have received awards all over the world for their sonar device. The Deeper Smart Sonar is probably the most well-known castable sonar and the best portable fish finder for shore fishing. There a few reasons to say that; first, their app is now quite advanced and stable. It syncs easily and quickly with Android and iOS devices via a WiFi hotspot. To start the system, all you have to do is place the pod in the water and sync. The communication range is advertised up 300 feet, and users have reported great results. 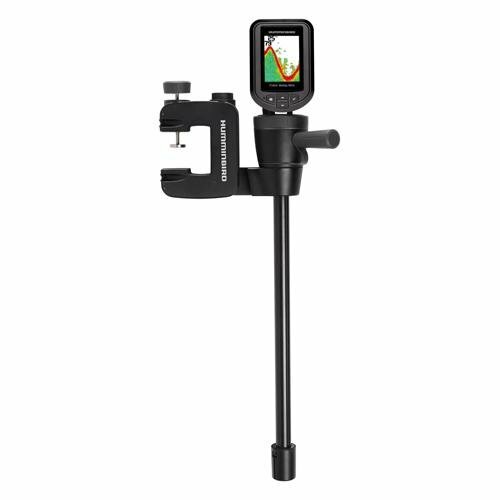 Second, Deeper Pro+ has the most capabilities of any of the castable fish finders. Along with dual beam sonar for marking fish, it has an internal GPS receiver, allowing you to create lake maps from shore. To make a map you just fan cast along the bank and the app will record the depths as you reel it in. The competition can make maps as well, but you have to be in a boat for the best results. The Deeper transducer pod is about the size of a baseball, weighs just 3.5 ounces. It’s recommended to use a stiff rod and heavy braided line when using it to prevent launching the pod off the line. If you want to mount it to a boat or kayak, they sell a flex arm that attaches to the pod and clamps to the boat. Deeper Smart Sonar Pro + is truly one of the most portable fish finders you can buy today. FishHunter offers two models of castable sonar that are comparable to the Deeper Pro and Pro+. 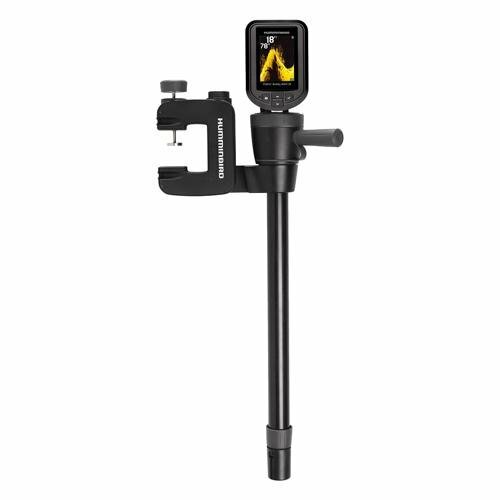 FishHunter Pro has a similar spec to the Deeper Pro, the main differences are FishHunter Pro has a Tri-Beam transducer, a shorter range with smaller max depth, but boasts a significantly longer battery life. 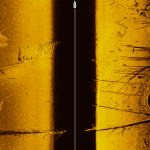 When standard sonar marks a fish, you know it is within the sonar cone, but depending on the depth it could be anywhere in the diameter of the cone. FishHunter Directional 3D solves that problem by using 5 directional sonar cones, creating detection zones on the app that tell you where to cast. The FishHunter app can create custom lake maps, but you need to be on a boat because it must have your smartphone nearby to use its GPS. The main drawback to this is because of the shape of the pod bottom, it can’t be towed very quickly without getting swamped by water. When water goes over the top of the pod you lose WiFi signal. If the pod were smooth, it would likely perform better. The FishHunter Pro and 3D pods are bigger and heavier than Deeper, but you gain the extra sonar crystals and longer battery life. If you think the Directional 3D capabilities would be useful to you, don’t be afraid to buy the FishHunter, it’s a very good unit for the price. At just 2.3“ in diameter and 1.7 ounces, the iBobber is the smallest castable fish finder. It also boasts a 10+ hour battery life. 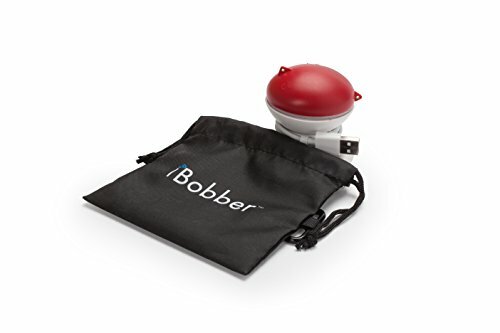 It connects to your phone using Bluetooth, which is a great technology, but if any water splashes over the bobber, it can cause signal disruption. For that reason using it on a boat or kayak may be a frustrating experience. If you value compact size, and a straightforward sonar and fish finding app, the Reel Sonar iBobber would be a decent choice. It’s priced much lower than Deeper and FishHunter and should suit the most basic bank fishing situations. 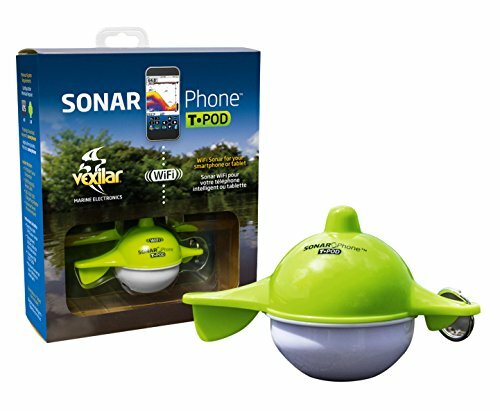 The Vexilar Sonarphone is another basic portable fish finder bobber that presents itself as an alternative to a regular fish finder. It operates on a single 125kHz sonar beam, which gets you a 120ft max depth. The Lithium-Ion battery has a limited 4 hour use life but in reality this most likely plenty for bank fishermen. There were early reports of difficulty connecting phones to the pod via the WiFi, but it seems those problems have been improving over time with better software. The Vexilar Sonarphone is a good alternative to the Reel Sonar iBobber for portable shore fishing use. The fish finders can be semi-permanently attached to a boat using the c-clamp, making them great for Jon boats, canoes, and more. The Fishin’ Buddy MAX is a unique product, one of a kind really. The Fishin’ Buddy MAX is basically a transducer on a stick that you can clamp onto the side or back of a boat. It runs on AA batteries, and there are no cables to route or get tangled with. The fish finder it comes with is the PiranhaMAX 197c, but it’s conceivable that the PiranhaMAX 4 will eventually replace it on the Fishin’ Buddy. The 197c is your basic 2D sonar unit, which will show you depth, temperature, and bottom composition. advanced version. It also is a transducer on a stick, but the transducer has Down Imaging capability. The stick on this version telescopes down to be clear of any boat obstruction and provide a clear side to side view for imaging. The Fishin’ Buddy MAX DI is a slightly moreOne cool thing about both Fishin’ Buddy MAX products is they can be used on float tubes when you purchase the BFT2 float tube accessory. This accessory has a strap that wraps around the float tube and has a cone shaped holder that you drop the Fishin’ Buddy into and you can go floating and fishing while having a depth finder to view. What is the Best Portable Fish Finder for Kayak Fishing? GPS and lake maps are great tools for fishing, and it doesn’t make sense to fish from a kayak without them. 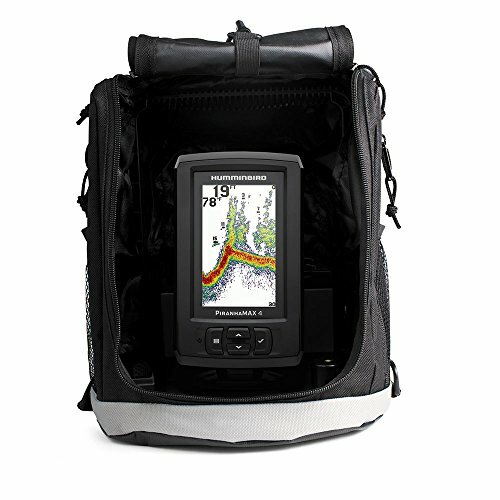 That leaves two options for portable kayak fishing, the Garmin Striker 4 Portable, and the HELIX 5 CHIRP GPS G2 PT. Both units can be setup in the base of a kayak, a with the suction cup transducer mounted to the hull. 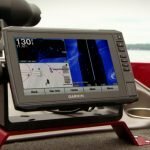 The Garmin has great sonar but no maps with the GPS, while the HELIX 5 has both GPS and an SD slot for using mapping cards, it simply depends on what you want. 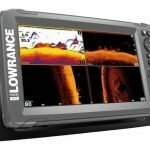 What is the Best Portable Fish Finder for Shore Fishing? For shore fishing, it’s hard to beat a castable fish finder, and the Deeper Pro+ is the highest rated option in the category. Deeper is compact, has excellent range, and you can create bottom maps of your favorite shore fishing spots. Use it with your Android or iOS device, and connect to the pod with a WiFi hotspot. It doesn’t get much easier than that. 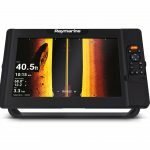 What is the Best Fish Finder for a Float Tube? Your best bet for float tube fishing is the Fishin’ Buddy MAX and MAX DI paired with the BFT2 float tube accessory kit. You strap the fish finder holder to the float tube, and drop in the Fishin’ Buddy for a hands free fish finder so you can focus on fishing. 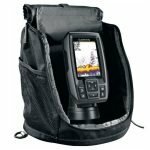 What is the Best Portable Fish Finder for Ice Fishing? 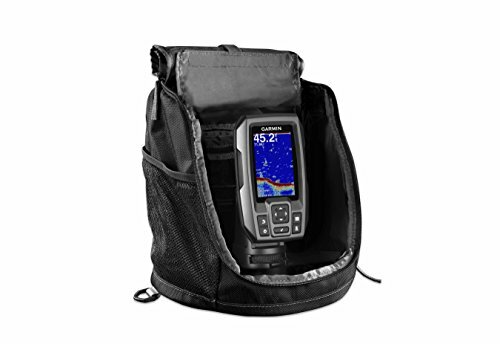 The Garmin STRIKER 4 Portable has a built in Ice Fishing flasher mode, making it excellent for the occasional ice fishing trip. Just charge the battery, grab the included transducer float and you’re ready to go. How do I Mount a Portable Transducer? Each unit is a little different, but traditional units will typically use a suction cup mounted transducer. You simply adjust the angle and lock down the suction cup. Castable fish finders can be tied to the boat with a length of rope or heavy braided fishing line. 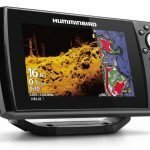 Do I Need GPS on a Portable Fish Finder? Whether you need GPS or not depends on how serious you are about your fishing. Bank fishing definitely doesn’t benefit from GPS as much as from a boat, but it can be handy when making custom lake maps. If you fish from a small boat or kayak, a GPS is extremely handy. Not only can you mark hotspots but you can return to them at a later day.